Jesus led me to the book of Song of Solomon recently and I am head over heels in love with it and it's writer. To be honest, I never really dove into this book because I didn't see Jesus in it. I wrongly believed it was a book about the love of a husband and wife. Yes, it definitely is but it is so much more. Song of Solomon encompasses many truths and themes. All of them are deep and lavished with God's crazy, unfailing love for us. 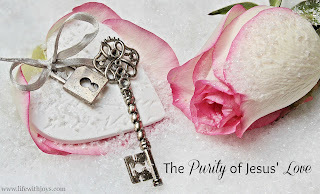 In this post, we will focus on the theme of purity. Before you rush to close this site, allow me the chance to show you that our past has nothing to do with our purity. Jesus is not about guilt and shame nor am I. We will cover guilt and shame in this post and I will hopefully prove to you that you need not feel either. I am so grateful for the love and mercy Jesus has shown me in spite of, and in the midst of, my awful messes. He took this girl full of shame and sin and gently wiped me clean and put a crown of beauty on my head. If you think your past defines you, I can 100% guarantee it doesn't. If you are knee deep in sexual sin at this very moment, I promise you Jesus is waiting with an open heart to wash you clean. He sees a beauty when He looks at you. Don't let the lies in your head convince you any differently. Now let's dive in and learn about the purity of Jesus' love. May you be blessed and find freedom. The beauty of Song of Solomon is that it frees our hearts and allows us to be shameless and wildly passionate in our pursuit of the love Jesus has for us. Too many people believe that being a Christian means that life will be a bore. Sadly, they subscribe to the notion that Jesus girls are prim, proper, lacking laughter, and in bed by 8pm! Thankfully, that is just not true. Women on fire for Jesus laugh often, love big, feel passion, wear bright colors, and stay up late. Having a relationship with Jesus leads to untamed love. Untamed love leads to the abundant life Jesus promises in John 10:10. Girlfriend, get ready to fall crazy in love as you learn that Jesus is beyond crazy in love with you. He is ravished by you! The word purity is synonymous with freedom and freedom in synonymous with joy. Merriam-Webster's dictionary defines the word pure as unmoved with any other matter...free from dust, dirt, or taint...free from harshness...free from what vitiates, weakens, or pollutes. But if we walk in the light as He Himself is in the light, we have fellowship with one another, and the blood of Jesus His Son cleanses us from ALL sin. If we confess our sins, He is faithful and righteous to forgive us our sins and to cleanse us from all unrighteousness. In order to be cleansed from sin, we must confess our sins to Jesus. Confession is more than saying the sin we committed. It involves being sorrowful for it. Sorrowful is not the same as shamed. Hear me when I say that please. To be sorrowful is to be sorry and desiring to turn away from the sin. Shame is from the devil. Sorrowful confession is a gift from Jesus. They are complete opposites. If you feel ugly, broken, and condemned, I can assure you that is not from sweet Jesus. Tattle to Jesus about what the devil is telling you and then watch Him take action for His baby girl! As we confess our sins, we must trust that we are being cleansed and purified. Look back at the definition for pure. It states that to be pure is to be free from what weakens and pollutes us. Sin does both, but Jesus takes His love rag and shines us back to a beautiful woman of purity. He does this because he adores us. He knows what sin causes and He doesn't want us to suffer. He already did that for us. There is no need to repeat the torture. Read Isaiah 1:18. Jesus is speaking this to you and over you. Though your sins are like scarlet, they will be white as snow; though they are as red as crimson, they will be like wool. If you are willing and obedient, you will eat the good things of the land. JUST LIKE THAT - JESUS PURIFIES US AND WE ARE AS WHITE AS SNOW. Now let's talk about the guilt and shame the word purity can conjure up in many of us. I have no doubt that many women reading this do not feel pure. You may feel trapped by past or present sexual sin. You may have suffered sexual abuse and have never felt pure. Sexual sins and abuse can leave us feeling tainted and used. Our eyes may flow with tears at the desperate desire to feel purity, but as much as we try we just feel dirty, shamed and rotten. I write this with an understanding and loving heart. You see, I have been in the pit of sexual sin. I know what shame wears like. It is a heavy burden that leaves us feeling weak and torn down. I never thought I would feel pure. God rescued me from my sins and shame. If He can cleanse me and create life in me, I have no doubt He will do it for you too. In fact, I am beyond convinced He will. He wants nothing more than for you to feel and know His love and redemption. He longs to make you as white as snow. As they were eating, Jesus took bread. blessed and broke it, gave it to the disciples, and said, "Take and eat it; this is My body." Then He took a cup, and after giving thanks, He gave it to them and said, "Drink from it, all of you. For this is My blood that establishes a new covenant; it is shed for many for the forgiveness of sins." This Scripture passage is the Last Supper. The beautiful first communion is with Jesus, by Jesus, for Jesus, and for all of us. Jesus knew he would soon be the sacrificial lamb. He lovingly and willingly went to the cross for each one of us. He was aware of the suffering and pain He would endure. Yet, He did it anyway. That, my friend, is what pure love looks like. I write this with the deepest love and compassion for all of you. He did not go to the cross so we could wallow in our guilt and shame. He did it out of pure love. His pure love leads to our purity. Period. Notice that in verse 28 Jesus clearly stated that He was pouring out His blood for the forgiveness of sins. Let that sink into your sweet heart. Jesus knows and loves you with a deep and passionate heart. Won't you allow Him to cleanse and purify you? He's waiting with open arms. Then I will come to the alter of God, to God, my greatest joy. I will praise you with the lyre, God is my God. As I write this, the song "How Can it Be" by Lauren Daigle sings to me. Oh pure one, go listen to it and let the words invade your heart. Raise your hands in the air and ignore the cleansing tears that roll down your beautiful face. You, sweet child of God, are forgiven and pure. Before we conclude, allow me to show you the biblical definition of purity. In the Old Testament, the Hebrew word for purity is 'niqqayon'. It is an emptying out or being clean. Biblestudytools.com states the following and it is profound. "Purity is opposed to being guilty." Let that penetrate your brain and find its way to your heart. God purifies you when you confess. Once you are washed clean, there is NO guilt. God does not call you guilty. He calls you pure. The two cannot exist together. If you struggle with guilt, take it to God. confess your heart and trust Him to remove the guilt. I pray that your heart is full with the knowledge of your purity. No matter what you have done or gone through, you are clean and pure. The love and promises from Song of Solomon were penned with you in mind. Remember, Jesus is ravished by your purity and beauty. You, dear one, are passionately loved by your King.